Leroy Lester Holcombe was born on 17 May 1906. He was the son of Asa Jay Holcombe and Pearl Knowlton. Leroy Lester Holcombe married Bertha Julia LaPlanche. Leroy Lester Holcombe died on 26 January 1956 at Warrensburg, NY, at age 49. [S182] Social Security Death Index (on-line), Ancestry.com, SSDI, Ancestry.com, SSAN 106-34-0347. Jay Holcombe was the son of Asa Jay Holcombe and Pearl Knowlton. Jay Holcombe died before 15 April 1910. [S182] Social Security Death Index (on-line), Ancestry.com, SSDI, Ancestry.com, SSAN 118-10-6751. Emma W. Dunlop was born on 3 November 1823 at Crown Point, Essex, NY. She married Amos Charles Holcombe, son of Charles Holcombe and Sarah L. Smith, on 29 October 1842 at Johnsburg, Warren Co., NY.1 Emma W. Dunlop died on 29 January 1900 at North Creek, NY, at age 76. [S645] Donald Grant Martell, "Amos Charles Holcomb," e-mail to James Hallowell Holcombe, 25 November 2007. Warren and Mary were enumerated in the 1900 Johnsburg, Warren Co., NY, federal census. He was a farmer, age 43, she was 26. The only child in the household was George F. 1. Warren and Mary were enumerated in the 1910 Putnam, Washington Co., NY, federal census. He was a farmer, age 52, she was 37. Children in the household were George H. 11, Lelah 8, and Lillian 7. Warren was enumerated in the 1920 Johnsburg, Warren Co., NY, federal census. He was a farmer, age 63. The only other member of the household was son George 21. Lillian was enumerated in Johnsburg in the household of Abia Ross; she was 16. Warren was enumerated in the household of his daughter Grace Chasson in the 1930 Johnsburg, Warren Co., NY, federal census. He was 73. [S644] Fred Truman, "John Truman," e-mail to James H. Holcombe, 16 November 2007. Mary Ellen Mattison was born in July 1856 at England. She married Charles Frederick Holcombe, son of Amos Charles Holcombe and Emma W. Dunlop, in 1872.1 Mary Ellen Mattison died on 28 October 1944 at North Creek, NY, at age 88. Pearl Knowlton was born on 30 November 1888. She married Asa Jay Holcombe, son of Charles Frederick Holcombe and Mary Ellen Mattison, circa 1903. Pearl Knowlton died on 22 May 1942 at age 53. Gov. Simon Bradstreet was born on 18 March 1603 at Horbling, Lincolnshire, England. He married Anne Dudley, daughter of Gov. Thomas Dudley and Dorothy York, circa 1628 at Northamptonshire, England. Gov. 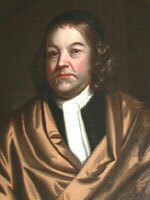 Simon Bradstreet died on 27 March 1697 at Salem, Essex Co., MA, at age 94. Simon, a colonial statesman and governor of Massachusetts, was born in Horbling, Lincolnshire, England, and was baptized on 18 March 1604, the son of Simon Bradstreet, vicar of Horbling, and Margaret (maiden name unknown). In 1617 he entered Emmanuel College, Cambridge (of which his father had been a fellow), and received the degrees of B.A. in 1620 and M.A. in 1624. Between 1621 and 1624 he served as assistant to Thomas Dudley, steward to the earl of Lincoln, and then became steward to the dowager countess of Warwick. These connections led to his first marriage, probably in 1628, to Dudley's eldest daughter, Anne, soon to win renown as the poet Anne Bradstreet, and to association with the company of Puritan gentry planning to immigrate to New England. On 18 March 1630, at a meeting in Southampton, Bradstreet was elected an assistant in the newly chartered Massachusetts Bay Company and assumed duties as its secretary. Two weeks later he sailed for America with his wife and the Dudley family in the fleet led by Governor John Winthrop (1588-1649). In Massachusetts, where the company transformed itself into a colony, Bradstreet settled in Cambridge and continued his administrative tasks. He served as colony secretary until 1636 and, except during the period of direct royal government between 1686 and 1689, continued to be annually reelected to the magistracy (first as assistant, then in 1678 as deputy governor, and, from 1679, as governor) until his retirement in 1692, the longest recorded service of any colonial New England official. Throughout, he sat on numerous General Court committees. He was especially active in the negotiations that in 1643 created the New England Confederation, an alliance between the colonies of Massachusetts, Plymouth, Connecticut, and New Haven. He served as commissioner or alternate from Massachusetts to the confederation for twenty-four of the next thirty-four years. In political affairs, Bradstreet consistently positioned himself as a moderate anxious to play down authoritarian tendencies in government and conflicts with the outside world. He sided with the Massachusetts deputies against a majority of his fellow magistrates in a prolonged debate over the degree of discretionary authority to be accorded the magistrates in the day-to-day business of government, and he strove to moderate the punishments inflicted on Robert Child when Child tried to appeal beyond Massachusetts to the English Parliament in 1646 for greater civil liberties and a Presbyterian system of church organization within the colony. Bradstreet joined other Essex County magistrates in 1643 in protesting Winthrop's policy of intervening in a dispute over who was the legitimate ruler of French Acadia (Nova Scotia). In 1661, after the restoration of the English monarchy, he was chosen, with Boston minister John Norton (1606-1663), to travel to London in an effort to allay the Crown's reputed hostility to Puritan Massachusetts. Arriving in England the following spring, the two emissaries quickly secured a royal letter confirming the Massachusetts charter and pardoning past offenses. Upon their return in 1663, however, they found that the letter's other provisions, commanding greater religious toleration and a suffrage no longer restricted to church members, only confirmed suspicions among colonists opposed to the mission that Bradstreet had been too passive in presenting their case for virtual autonomy from the Crown. These fears did not prevent Bradstreet's election as governor in 1679, as England was again pressing Massachusetts for greater conformity to royal authority. But they produced sharp political divisions during his term of office. Some denounced him by 1684 as so accommodating to visiting royal officials as to be an enemy to his own colony. Others, such as his allies Joseph Dudley and William Stoughton, pressed him to bend still further to London's demands. Once more, Bradstreet steered a middle course. He bowed to the Crown's eventual nullification of the Massachusetts charter but refused to accept office in the royally governed Dominion of New England, imposed in place of charter rule in 1686, on the ground that its authoritarian structure abridged the colonists' liberties. When, on 18 April 1689, the dominion and its governor, Sir Edmund Andros, were overthrown by an armed uprising in Boston, the aged Bradstreet was brought out of retirement to serve as president of a council of safety and then, after June, as governor in a restored charter administration, a post he held despite increasing physical weakness until the arrival of a new royal governor, Sir William Phips, in May 1692. From February 1690 until 1692 his governorship also extended over the neighboring province of New Hampshire. Bradstreet's long political service won him respect and renown as "the Nestor of New England." Jasper Danckaerts, a Dutch visitor to Boston in 1680, found that the "quiet and grave" governor "dwelt in only a common house, and that not the most costly.. . . He was dressed in black silk, but not sumptuously." Joshua Scottow, in "A Narrative of the Planting of the Massachusets Colony" (1694), hailed Bradstreet as "the only surviving Antiquary of us Nov-Angles, the Prime Secretary and Register of our civil and sacred Records, and the Bifronted Janus who saw the Closure of the Old and the Overture of this New-Albion World." Anne Bradstreet's verse provides a more intimate portrait: "If ever two were one, then surely we," she began the lines addressed "To My Dear and Loving Husband" (1678). Together, they raised four sons and four daughters, "eight birds hatcht in one nest," all of whom married into the colony's most prominent families. From Cambridge, the Bradstreets moved to Ipswich in 1635 and, by 1646, to the frontier settlement of Andover (what is now North Andover). After Anne's death in 1672, Bradstreet lived in Boston. In 1676 he married Anne Downing Gardner, thirty years his junior and a niece of former governor John Winthrop. The marriage was childless, and the couple passed their final years at Salem, where Bradstreet died. Bradstreet never ranked among the wealthier men of the colony, and he took no lasting interest in mercantile affairs. But with the frequent grants of land given him for his public service he became a leading property developer and absentee proprietor, owning lands that fell within the boundaries of the towns of Hadley, Topsfield, Andover, Salisbury, and Lynn, together with large tracts in Maine. After 1660 he was an active member of the Atherton Company, a powerful group of speculators seeking to develop the Narragansett territories between Rhode Island and Connecticut. His 1689 will disposed of over fifteen hundred acres of land in Massachusetts alone. William and Gertrude were enumerated in the 1900 Johnsburg, Waren Co., NY, federal census. He was a day laborer, age 30, she was 24. The only child in the household was Beecher E. 2. Louis H. and Hattie W. were enumerated in the 1910 Johnsburg, Warren Co., NY, federal census. He was 23, she was 22. Children in the household were Myrtle M. 3, and Milton 8 months. Louis H. and Harriet were enumerated in the 1920 Johnsburg, Warren Co., NY, federal census. He was a steam shovel operator in a mine, age 33, she was 31. Children in the household were Myrtle M. 13. Milton L. 10, and Muriel L. 4 years 6 months. Louis and Harritte W. "Roble" were enumerated in the 1930 Warrensburg, Warren Co., NY, federal census. He was a steamshovel operator, age 43, she was 42. Children in the household were Myrtle M. 23, Milton L. 20, Geneva M. 14, Jean A. 9, and Kenneth H. 3. [S182] Social Security Death Index (on-line), Ancestry.com, SSDI, Ancestry.com, SSAN 083-09-9133. Lester E. Tuller was born on 1 May 1877. He was the son of Erskine Tuller and Susan C. Travers. Lester E. Tuller married Sarah E. Brown in 1904. Lester E. Tuller died after 1919. [S182] Social Security Death Index (on-line), Ancestry.com, SSDI, Ancestry.com, SSAN 074-28-1702. [S182] Social Security Death Index (on-line), Ancestry.com, SSDI, Ancestry.com, SSAN 122-28-3493. Minor M. and Mary E. were enumerated in the 1900 Simsbury, Hartford Co., CT, federal census. He was a farmlaborer, age 26, she was 26. Children in the household were Mabel A. 5, and Milton L. 4. Eleanor Holcombe was born in 1915. She was the daughter of Asa Jay Holcombe and Pearl Knowlton. [S182] Social Security Death Index (on-line), Ancestry.com, SSDI, Ancestry.com, SSAN 045-07-5240. Helen Anne Holcombe was born on 20 November 1934 at Warrensburg, NY. She was the daughter of Leroy Lester Holcombe and Bertha Julia LaPlanche. Helen Anne Holcombe died on 7 March 1994 at Glens Falls, Warren Co., NY, at age 59. William Sharpless Jackson married Helen Maria Fiske in 1875. [S820] Scott C. Steward and Chip Rowe, Robert Winthrop, page 123. Edward Hutchinson was born on 28 May 1613 at England. He was the son of William Hutchinson and Anne Marbury. Edward Hutchinson married Catherine Hamby on 13 October 1636. Edward Hutchinson died on 19 August 1675 at Boston, Suffolk Co., MA, at age 62. Ruth Embler was born on 14 July 1856 at Mongaut, Sullivan Co., NY. She married Sterling Benjamin Holcombe, son of Benjamin S. Holcombe and Lois Delight Chappell. William Hutchinson was born on 14 August 1586. He married Anne Marbury, daughter of Francis Marbury and Bridget Dryden, on 9 August 1612 at St. Martin Vintry, London, Middlesex, England. William Hutchinson died in 1642 at Boston, Suffolk Co., MA. Knud Peder Knudsen was born on 16 April 1866 at Hojby, Odense, Denmark. He married Katherine Nielsen on 3 October 1900 at Kenosha, Kenosha Co., WI. Knud Peder Knudsen died in 1934 at Kenosha, WI.